The prescribed application forms are either available online or from the local authorities, i.e. the Sub-Divisional Magistrate/Tehsildar's office/Revenue Department/District Collector's Office, or any other authority as specified in the State/UT of your residence. You will be required to produce proof of continuous residence in the State/UT for a specified minimum period, or that of holding land in the State/UT, depending on the rules in the State/UT concerned. 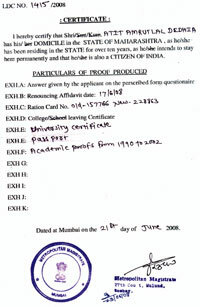 Documents for proving your identity, attestation of the form by officers with the necessary authority, school certificates and the Tehsil Enquiry Report may also be required. Women not originally belonging to a State/UT, but married to men who are permanent residents of the State/UT or who are eligible for the State's/UT's Domicile Certificate, are eligible to apply for Domicile Certificate.